Born in London, England, I am an emerging photographer whose work captures the magic to be found in the natural world around us. Although I spent my formative years in the concrete jungles of the Far East, I have always been fascinated by landscapes, especially forests, woodlands and the streams that run through them. I use my art to encourage environmental protection. I work in large format black & white, developing and printing my work in my darkroom. When I hear the word landscape, I think of scenes like rolling hills, mountains, seascapes, woodlands. However, the term is broader than that application. If you ask Wikipedia – the font of all knowledge – what landscape photography is, you’ll see that “[it] shows spaces within the world, sometimes vast and unending, but other times microscopic. 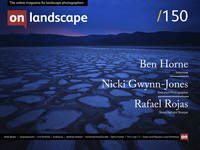 Landscape photographs typically capture the presence of nature but can also focus on man-made features or disturbances of landscapes.” Even landscape photography competitions like Landscape Photographer of the Year have a category for urban landscapes. I hadn’t thought about that when I went to see “A Green and Pleasant Land”, so I was a little surprised to see more than images of the landscapes I love. The exhibition at the Towner Gallery in Eastbourne, on until 21st January 2018, is major survey exhibition which focuses on artists who have shaped our understanding of the British landscape and its relationship to identity, place and time. Exploring how artists interpret urban and rural landscape through the lens of their own cultural, political or spiritual ideologies, the exhibition reveals the inherent tensions between landscape represented as a transcendental or spiritual place, and one rooted in social and political histories. The exhibition comprises almost entirely photographs although there are also a few sculptures and paintings. The title is a slight misnomer: images range from the bleakness of industrial Britain in John Davies’ Agecroft Power Station to not-so-typical holiday scenes in Melanie Friend’s Avro Lancaster Bomber showing a bomber flying over a crowded beach. They have been drawn largely from the Arts Council Photography collection, and the images were made between 1970 and 2016. With the appointment of an Arts Council Photography Officer in 1973, photographers were freed from the constraints of commercial commissions and, supported by arts council funding, were able to explore their own ideas. This transformed photography and in particular made an impact on the appearance of landscape photographs. Some works have also been borrowed from the Hyman collection, Impressions Gallery, Purdy Hicks Gallery, Brighton Museum, Kate MacGarry Gallery, The Approach, and from the participating artists. The title is a slight misnomer: images range from the bleakness of industrial Britain in John Davies’ Agecroft Power Station to not-so-typical holiday scenes in Melanie Friend’s Avro Lancaster Bomber showing a bomber flying over a crowded beach. John Kippin’s Hidden, National Park Northumberland shows the remnants of a fighter plan, taken over gradually by nature in a remote moorland. Jem Southem’s The Pig, the Lamb and the Goat brings us a classic, bucolic scene but on a misty, grey day, while Fay Godwin’s, Maenserth Standing Stone brings us a traditional black and while view of rolling hills and sky. What is true is that all the artists were united by a desire to explore the landscape as a manifestation of their personal ways of seeing it, rather than showing a representational view of the natural lie of the land or geography. “These different approaches shape our understanding of the land we live on, its relationship to identity, place, time, and to the politics of land and its representation. these artistic intentions are contrasting throughout the exhibition. Artists who are responding to the landscape as a spiritual space tend to a view of the landscape from the inside. They inhabit the space and their artistic sensibilities result from feeling the presence of the earth. Light, texture and detail are important and viewpoints are often close. On the other hand, artists commenting on the ways in which class, economics and culture shape the landscape tend to look from the outside.” Their work often includes evidence of human activity – people, buildings, ruins, pylons – suggesting the landscape is not picturesque, but instead represents a collision of ideologies. Crisscrossed with transport networks, industrial and housing developments they depict the land as constantly evolving to take account of human need. Themes of the artworks include impermanence, permanence, human intervention, and how the land recovers from industrial activity. Three photographers explore the social impact of The Troubles in Northern Ireland, each in their own way. Clare Woods and Ben Rivers explore strange worlds hidden within our own. Themes of the artworks include impermanence, permanence, human intervention, and how the land recovers from industrial activity. The photographers used various tools from, large format cameras to DSLRs. Simon Roberts, who photographed an election campaign among other things, bought a campervan and photographed standing on its roof. Donovan Wylie went even higher, using only a helicopter to photograph the borderland watchtowers in Northern Ireland. Mishka Henner, whose aim is to really, deeply understand the landscape, used software like Google Earth and Street View to search out what is hidden rather than just photographing what is easily seen. Some of the scenes shown in the exhibition no longer exist. Donovan Wylie’s watchtowers were demolished by the British government as part of their demilitarisation of Northern Ireland. Trees have been chopped down. Open spaces have been built on. What we’re offered are scenes captured at a moment in time, a few of which have now changed beyond recognition. We’re also offered views of an industrial life that is increasingly in decline. Images of people at the seaside, made in an era of greater innocence, foretell a changing political and military climate, with bombers flying over the heads of the oblivious bathers. The space holding the artworks is exquisite; tall ceilings with skylights allow natural light to flood in. Each of the rooms is large and airy, and each artwork is given enough space to breathe on the whiter-than-white walls. Image sizes range from small to taking up a whole wall. The framing is eclectic, with an eye to drawing out the best of each image rather than presenting a unified set of mounts and frames. A Green and Pleasant Land gives us a snapshot of British culture, politics, history, art and yes, landscapes from the 1970s onwards and how they’ve changed, or not, over the last four decades. The artworks capture everything from intimate, micro scenes to large impersonal ones, from green fields to desolate power station chimneys, from ground up to sky down. It is well worth a visit. And while you’re in Eastbourne, take the time to walk along the promenade and enjoy the view of the sea. Opening hours Tuesday – Sunday and Bank Holiday Mondays 10am to 5pm until 21st January 2018. The exhibition is curated by Greg Hobson and Brian cass, Head of exhibitions at Towner. The artists included are: Keith Arnatt, Gerry Badger, Craig Barker, John Blakemore, Henry Bond and Liam Gillick, Paul Caponigro, Thomas Joshua Cooper, John Davies, Susan Derges, Mark Edwards, Anna Fox, Melanie Friend, Hamish Fulton, Fay Godwin, Andy Goldsworthy, Paul Graham, Mishka Henner, Paul Hill, Robert Judges, Angela Kelly, Chris Killip, John Kippin, Karen Knorr, Ian Macdonald, Ron McCormick, Mary McIntyre, Peter Mitchell, Raymond Moore, John Myers, Martin Parr, Mike Perry, Ingrid Pollard, Mark Power, Paul Reas, Emily Richardson, Ben Rivers, Simon Roberts, Paul Seawright, Andy Sewell, Theo Simpson, Graham Smith, Jem Southam, Jo Spence, John Stezaker, Paddy Summerfield, The Caravan Gallery, Chris Wainwright, Patrick Ward, Clare Woods and Donovan Wylie.